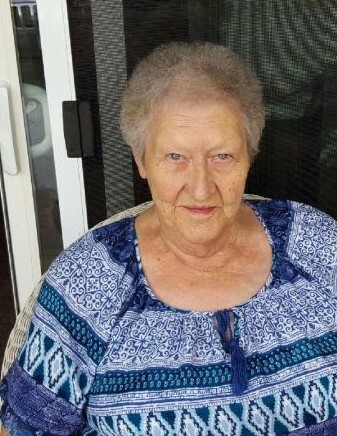 Carmen Elaine Fitzsimmons, 83, passed away on Wednesday, February 6, 2019, surrounded by loved ones. Mom was born to Marion John and Rebecca Louise Ambrose in Buhl, Idaho. She met Jim Fitzsimmons in 1955 at Mountain Home Air Force Base and they married in 1956. They later divorced. Mom loved playing and watching golf, traveling and camping, but her favorite thing to do was visit with friends and family when they came to see her. At the end of every visit she would say, “Wish you didn’t have to go”. She was a proud grandma, “Gram”, and great grandma, “GG”, and would do anything for her children and grandchildren. Mom was a life-long member of Beta Sigma Phi Sorority. She was also a Senior Companion prior to her health declining. Mom leaves behind her two children, Alan (Lynn) and Tami (Pete); four grandchildren, Sarah (Veronica), Jennifer (Josh), Jake (Rachel) and Erin (Aaron); three great-grandchildren with another on the way in July, and seven bonus great-grandchildren; three brothers and one sister. She also leaves behind a very special friend, Diane Reed, who helped mom so much over the years. They loved getting their nails done together and going to Grannie Annies to eat. Mom was preceded in death by her parents and an Angel-Baby great-grandson. A special thank you to all those who provided medical care to Mom over the years, specifically: her primary physician Dr. Adam Nebeker for his compassionate care over the years; her hospice nurse Andrea Greenhalgh, with whom she shared all of our family secrets during their time together; Dr. Paul Barney, Heidi Hislop, RN, Linda and the CNA’s at Davis Hyperbaric and Wound Care for their excellent care, friendship and laughs; her favorite caregivers Ellie, Riley, Celeste and Jason at SOPA, and the doctors, nurses and CNA’s at McKay Dee Hospital who were so caring and compassionate during her last few days. We can’t thank you all enough! A memorial and graveside service will be held at a later date at Leavitt’s Mortuary in Ogden. In lieu of flowers, please spend time with a loved one. Until we meet again Mom, “wish you didn’t have to go”.